We are delighted that the Proceedings of the 7th RWSN Forum are now available to download and to cite. We hope that this huge body of knowledge and experience will be used to help improve rural water services all over the world. Extending the human right of access to water supply and sanitation (WSS) services to Indigenous Peoples represents the final step for many countries to reach universal coverage in Latin America and the Caribbean (LAC). As the 7th Rural Water Supply Network Forum is underway in Abidjan, Côte d’Ivoire, we must remind ourselves what “inclusion” means in the WSS sector. Poverty levels among Indigenous Peoples are more than twice those found among other Latin Americans, and they are 10 to 25 percent less likely to have access to piped water and 26 percent less likely to have access to improved sanitation. With dire consequences on health, productivity, and well-being, these access gaps also exemplify two shortcomings of past engagement with Indigenous Peoples in the WSS sector: Indigenous territories have often been overlooked, and, even where investments specifically target Indigenous Peoples, WSS service sustainability remains a large issue. Several barriers explain this: investors’ and service providers’ lack of understanding of Indigenous Peoples’ unique social and cultural characteristics, limited engagement with Indigenous authorities and attention to their priorities and aspirations, and the remoteness and difficult access to many Indigenous communities, to name a few. More generally, we need a tailored approach that responds to these challenges through institutional development, partnership with Indigenous authorities, and local capacity building for WSS services management in order to overcome the existing system that incentivizes physical interventions in easily accessible areas with limited social accompaniment. To effectively and permanently close this coverage gap, Indigenous communities in LAC must be reached in ways that respect their structures and world views , foster their ownership over their systems, and in doing this, enhance WSS services sustainability. Respect of Indigenous Peoples’ unique and valuable world views and forms of organization through their active involvement throughout the project cycle. Ownership by Indigenous Peoples over their WSS services developed through a demand-responsive approach to reflect a community’s commitment to define, implement, use and look after their WSS solutions. Sustainability in the provision of WSS services through specific, institutionalized mechanisms for operation and maintenance that reflect Indigenous Peoples’ customs and norms, including tailored technical assistance and active beneficiary involvement. Changing the mindset of political leaders in order to prioritize investments and institutional efforts towards the most vulnerable, traditionally excluded, and poor communities is a long-term transformational process that requires strong leadership and targeted knowledge. We have the experiences and tools at our disposal to push for this dialogue and to make sure that, when we do engage Indigenous Peoples for WSS service provision, we work with them as partners and leverage their traditional knowledge and cultural norms as assets. In the light of this global forum, which brings together practitioners from all over the globe, we call on fellow practitioners to join us in the fight to reach this last mile. For more practical guidance and operational tools to promote the inclusive delivery of sustainable WSS services to Indigenous Peoples in LAC, please refer the full publication of the Toolkit “Water and Sanitation Services: Achieving Sustainable Outcomes with Indigenous Peoples in Latin America and the Caribbean.” Also available in Spanish here. Thank you to everyone who made the 7th RWSN Forum such an astonishing success. The feedback from all of the participants we spoke to was over-whelming positive. In the end 444 delegates from 65 countries across 6 continents attended. The core organising team (Kerstin, Sean, Meleesa & Victor) would like to thank the hundreds of people who made this event possible : the authors, the reviewers, the international Task Force, the Government of Cote d’Ivoire, the sponsors, the participants, the translators, the staff at the Radisson Blu and the many sub-contractors and suppliers, particularly AdVision and MasterClays. Also a huge thanks the RWSN Executive Steering Committee and colleagues at Skat Consulting – most particularly our Director, Jürg Christen, who gave us the space and support to take risks and make it happen. We will be going at a slower pace over the coming days and weeks, however, we will be updating this website to add the presentations, films, photos, media coverage and correct wrong or missing links to papers. 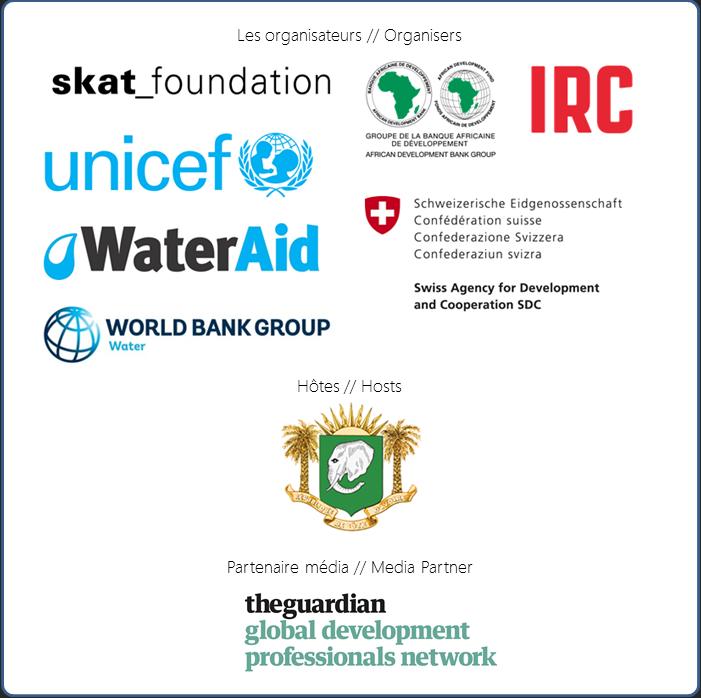 We are delighted to confirm that the The Guardian global development professionals network will be the media partner for the RWSN Forum. The Guardian, based in London, is a global news organisation that takes a strong interest in water and development issues, and will be helping us widen our knowledge exchange with like-minded professionals, and the general public, around the world. The Guardian Global Development Professionals Network offers commentary and insight from development experts across the world. Whatever your professional interest in global development, you’ll find it an invaluable source of knowledge and contacts. You can join the network, and follow it on LinkedIn, Facebook and Twitter. RWSN Forum Programme Announced Today! We are delighted to announce that the programme of the 7th RWSN Forum (29 Nov-2 Dec in Abidjan, Côte d’Ivoire) is now available. As you can see, it is a very diverse programme, covering rural and small towns’ water access from policy, financial, practice and user perspectives – with contributions from over 42countries. It is by bringing so much diversity, and many different players that this Forum is tackling the SDG challenge of Water for Everyone! The quality of contributions means that those attending will return home with new knowledge and new connections. As our programme is just out now, we have also extended the deadline for regular registration to the 31st October 2016. So those who have not yet managed to register and pay, please try to do so by the 31st October to benefit from the €600 fee. Over 500 people have registered so far, with confirmations from over 130. As with previous RWSN Forums, we expect a very diverse group to participate including government, private sector, NGO, donor, academia and civil society. You can register here. Many people have been contacting us for sponsorship to attend the event. Alas we have very limited funds as Forum organisers. However, we have prepared a help sheet for you to use within your organisation and with partners in trying to obtain assistance to attend.